Liskov Substitution Principle – is one of the SOLID principles defined by Barbara Liskov. Principle is based on the parent-child relationship in other words inheritance features of OOD (Object Oriented Design). Principle says “When class S is a subtype of class T then an object of type T can be replaced by an object of type S without affecting functionality/correctness of the implementation or program”. The following is an example of an electric bulb that actually violates substitution. When the bulb fails it is replaced with a new bulb. 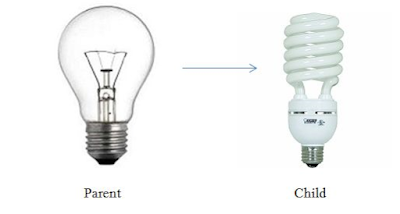 Here in this example the old bulb is replaced with the new bulb. Here in this example in the family of bulbs, considering the old bulb to be a parent of all bulb types and a CFG bulb is a child of the same family inherited from it. When one replaces a failed bulb, in other words in programming terms substitutes the old with the new, it must provide light that is provided by the old bulb, in other words works without affecting correctness or functionality (provides a constant light in the house). In the preceding example the substitution worked perfectly since there is no modification in functionality. The preceding image shows the violation of the principle. Since replacing with a decoration bulb (that provides light in the form of decoration) instead of a bulb meant for just providing light in the house. That actually is a violation in the sense of modifying the functionality because a decoration bulb does not provide the same functionality for the consumer. Continuing with bank savings account that is already explained in previous articles about the Open-Closed Principle. In the preceding code the IsavingAccount interface is implemented by a different kind of savings account of the bank, like Regular, Salary and FixDeposit savings account. But as per the banking rules, a FixDeposit savings account doesn't provide a withdrawal facility whereas another bank account might provide a withdrawal facility. So the developer might write code to raise an exception when an attempt is made to withdraw from a FixDeposit savings account. Now consider the following method in a class calling a withdrawal by casting the actual object to the parent class type. So the preceding code breaks the Liskov Substitution rule since the inherited FixDepositSavingAccount class is modifying the functionality of the withdrawal. Because the savings account should provide functionality to withdraw an amount without throwing any error. To stop violating the rule one must verify the inheritance tree, in other words child classes inherited from the parent class should not break the functionality when the child class object replaces the parent class object. So the class must inherit from the proper parent class in such a way that when the child class replaces the parent, it doesn't break the actual functionality provided by the parent class. It's not always true that one must make changes in the inheritance tree but making changes at the class and method level also resolves problems. To get such kind of example click on the link: Object Menter (Square and rectangle example). In the preceding image the new classes WithWithdrawal and WithoutWithdrawal are created and the child classes are inherited from the respective parent class. Developed code throws a run time error or exception or also might not work as expected and that leads to program failure or incorrect results. The preceding discussion shows an example of throwing an exeption by a child class for a not supported method. Read link: Object Mentor that shows an example (square and rectangle example) of giving incorrect results when not following the principle. So the biggest advantage of not following this rule is: it causes problems at runtime rather than causes application failure or incorrect results.